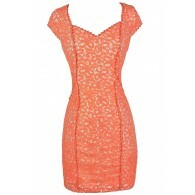 You’ll be the envy of everyone when you step out in this gorgeous designer dress! The Lace Overlay Embellished Waistband Chiffon Designer Dress is fully lined and crafted of floaty chiffon fabric. It has a sweetheart neckline and lined and lightly padded bust for support. Cream pleated chiffon fabric at the bust crosses over and has navy lace on top. The empire waist is adorned with sparkly beading and sequins, allowing you to shine! The chiffon skirt of the dress has a flouncy hemline and a layer of tulle underneath that adds a bit of shape to the skirt. Fabric ruching at the back of the dress expands to fit your shape. This dress is truly a knockout! It would be perfect paired with navy or cream pumps or strappy heels. You could also try wearing silver strappy heels and a cute clutch to match the beaded embellishment. This is the perfect dress for any upcoming holiday party or New Years event. Details: Fully lined. Lined and lightly padded bust for support. 100% polyester. Lining: 97% polyester, 3% elastane. Dry clean only. Size UK 8 measurements: Length from top of bust to hemline: 31”. Bust: 32-34”. You have added Lace Overlay Embellished Waistband Chiffon Designer Dress in Navy/Cream into Wishlist. You have added Lace Overlay Embellished Waistband Chiffon Designer Dress in Navy/Cream for Stock Notification. You have set Lace Overlay Embellished Waistband Chiffon Designer Dress in Navy/Cream as a loved product. You have removed Lace Overlay Embellished Waistband Chiffon Designer Dress in Navy/Cream as a loved product.